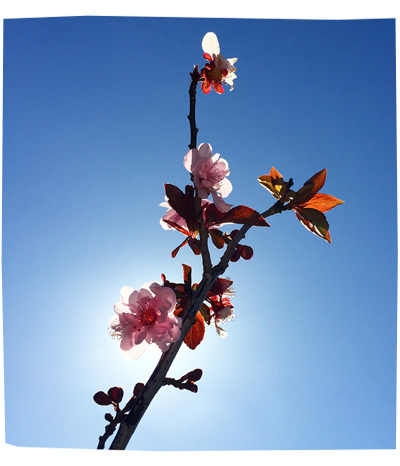 Carrying on with my theme of finding beauty in details… my plum blossom plant is going crazy! It is bursting with colour and joy in the warm sunshine! It is beautiful! Ironically, we planted it in our front yard, next to an ugly grey concrete fence… and it’s a bit tricky to take a pretty photograph of the whole plant. So to take THIS photo, I had to CRUSH myself and SQUAT awkwardly between the fence and the plant, point the camera into the sun, close my eyes, and snap continuously while waving my phone blindly. Thankfully the postman didn’t stop by or I would’ve looked like such a freak!